NETWORK FINALS: The GRAMMY AWARDS held the time-zone adjusted 7.8 from late yesterday, and the RED CARPET LIVE pre-show ended up at 2.1 after adjustment. In addition, AMERICA’S FUNNIEST HOME VIDEOS and DATELINE lost 0.1. CABLE HIGHLIGHTS: AMC’s THE WALKING DEAD returned, so of course it towered over everything else airing on Sunday cable, but its 5.72 was down a big 1.03 from last year’s February midseason premiere; TALKING DEAD, at 2.15 was down 0.53 from 2016; COMIC BOOK MEN, however, was up 0.05 to 0.40. E!’s GRAMMYS RED CARPET special was at 0.62. On HBO, LAST WEEK TONIGHT returned at 0.44, down 0.03 from its November finale; the final season premiere of GIRLS was at 0.24, down a hundredth from the 2016 premiere; and THE YOUNG POPE climbed 0.07 from its airing against the Super Bowl to 0.16. 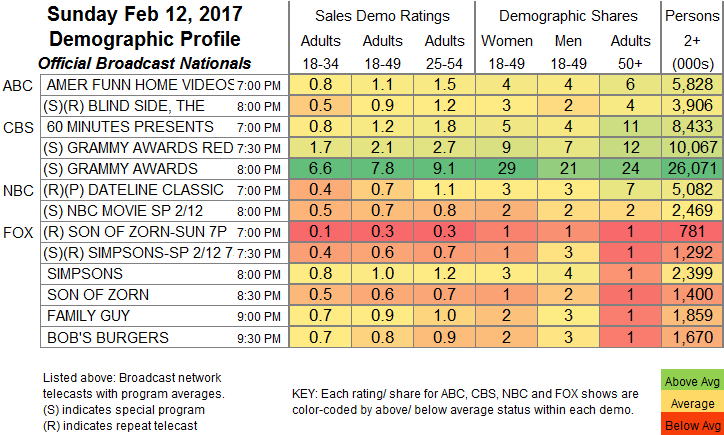 On Starz, THE MISSING returned at a dismal 0.06, preceded by BLACK SAILS, which was up 0.06 from its Super Bowl Sunday airing to 0.15. TLC’s LONG LOST FAMILY premiered at 0.24, with an AFTER-SHOW at 0.23. Adult Swim’s SUPERMANSION was one of the few shows to air a new episode on Super Bowl Sunday (after primetime, of course), and was up 0.04 to 0.38. Showtime’s HOMELAND dropped 0.05 from 2 weeks ago to 0.31. E!’s THE ROYALS returned from its week off down 0.03 to 0.17. Bravo’s REAL HOUSEWIVES OF ATLANTA, like most cable series, didn’t air against last week’s Super Bowl, and was down 0.09 from 2 weeks ago to 1.00, with FIRST FAMILY OF HIP-HOP down 0.04 to 0.34. 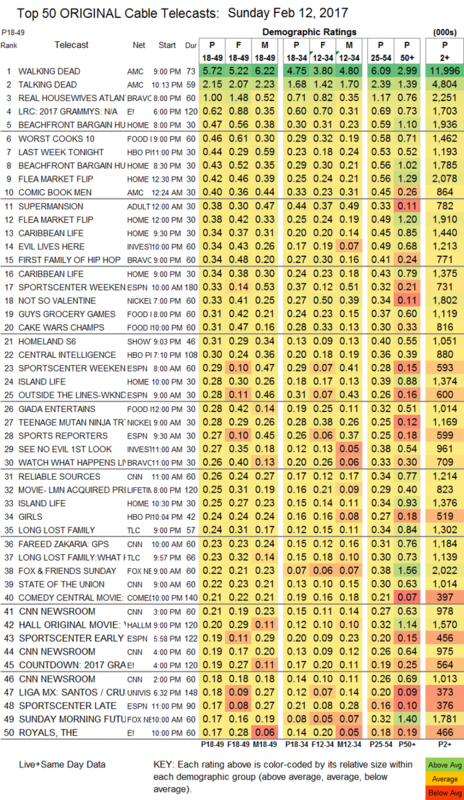 HGTV’s BEACHFRONT BARGAIN HUNT had 2 episodes in the Top 10 at 0.47/0.43 (compared to 0.51/0.42 2 weeks ago), and the afternoon FLEA MARKET FLIP episodes weren’t far below them at 0.42/0.38. Food Network did air new episodes last week, and GUY’S GROCERY GAMES rose 0.03 to 0.31, with CAKE WAR CHAMPIONSHIP at 0.31.